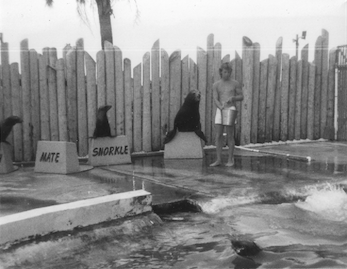 Russell McLendon works with several sea lions at the Gulfarium. For Russell McLendon’s family, working at the Gulfarium has been a family affair for over 35 years. As a celebrated young animal trainer he met his wife working at the park, and his kids would grow up to work there, with one daughter following in her father’s footsteps with a promising career as a marine mammal trainer. But it all started when 15-year old Russell McLendon strapped on an aluminum tank and a mask for the first time and entered the Living Sea with, as all divers did, a Splash! Flip through the pages of Images of America: Gulfarium Marine Adventure Park and, regrettably, you won’t find a photo of Russell McLendon. You will however find his name in the acknowledgments, and his stories inform several of the chapter introductions and many of the photo captions. But time has a way of keeping her secrets, and the only photo we unearthed of Russel working with the animals was too small to be published in the book–and that’s why I’ve published it here! McLendon was one of our first interviews. His family had a stack of old photos that we went through one night at his daughter’s kitchen table as he smiled and chuckled through story after story of his years at Gulfarium. He introduced us to Perry and Tanya the fearsome park guard dogs, Scooter and Clyde the harbor seals, and Big Mac the 7-foot manta ray. But I think that my favorite story Russel told that night was of capturing flying fish with the always resourceful and determined Brandy Siebenaler. Siebenaler fitted his 46′ Chris Craft Corinthian with a large, square PVC pipe frame that hung off the side of the boat. From the frame he draped a saggy white sheet and backlit it with a powerful spotlight. The after-dark result was a vision that could only be perceived by swimming fish as a bright, square moon hovering just inches above the water. The temptation of course was irresistible and flying fish quite literally flocked to it, leaping at it as the boat chugged around the Gulf of Mexico all night. The fish would hit the sheet and then slide down into a saggy pocket where they could be collected with ease. The plan was to stock the Living Sea with live flying fish, but McLendon said the fish turned out to be too fragile for that purpose, so they primarily became fresh, local food for the dolphins. Stories about innovative methods to accomplish the most challenging tasks–and their often unpredictable results–were one of my favorite things about researching this book. The stories chronicle an industry in its infancy, growing through adolescence and into adulthood. It took adventurous souls with the confidence and cunning to solve the occasional Rubik’s-level problem. ← Buy the book online! THE MYSTERY MAN IS MY DAD ! DONALD IRVING MCSHEEHY JR. Your dad was kind enough to join Gulfarium in hosting the regional IMATA conference in April. Everyone loved hearing his stories and were honored to meet one of IMATA’s first presidents.